A flexible line of credit that can be used for almost any purpose. Where Do Bonds Fit into Your Portfolio? Footnote 3 Options involve risk and are not suitable for all investors. Certain requirements must be met to trade options. Before engaging in the purchase or sale of options, investors should understand the nature of and extent of their rights and obligations and be aware of the risks involved in investing with options. Prior to buying or selling an option, clients must receive the options disclosure document "Characteristics and Risks of Standardized Options." Call the Investment Center at 877.653.4732 for a copy. A separate client agreement is needed. Orders which involve multiple option transactions will be charged a separate commission on each leg of the option order. Footnote 4 Merrill Edge Select® Funds meet a proprietary screening process developed by the Global Wealth and Investment Management Chief Investment Office (GWIM CIO). The listing contains no-load funds with no transaction fees and load-waived funds that are open for new and subsequent purchases. Available funds have a minimum initial investment of no more than $3,000. Each fund must have $100 million or greater ($500 million for Large Cap funds) in assets under management across all share classes offered by the fund. Note that index funds are not included in Merrill Edge Select™ Funds. Learn more about the Merrill Edge Select Funds methodology. Footnote 5 Merrill Guided Investing has an annual program fee of 0.45% based on the assets held in the account. This fee is charged monthly in advance. In addition to the annual program fee, the expenses of the investments will vary based on the specific funds within each portfolio. Actual fund expenses will vary; please refer to each fund's prospectus. Sales are subject to a transaction fee of between $0.01 and $0.03 per $1,000 of principal. There are costs associated with owning ETFs. Learn more about Merrill Edge pricing in the Merrill Guided Investing Program Brochure (PDF). Merrill Edge Select Portfolios has an annual program fee of 0.85% based on the assets held in the account. This fee is charged monthly in advance. In addition to the annual program fee, the expenses of the investments will vary based on the specific funds within each portfolio. Actual fund expenses will vary; please refer to each fund's prospectus. Where possible, institutional class shares are used to minimize expenses. Sales of ETFs are subject to a transaction fee of between $0.01 and $0.03 per $1,000 of principal. There are costs associated with owning ETFs and mutual funds. To learn more about Merrill Edge pricing, visit Merrill Edge Advisory Account ADV brochure (PDF). When you purchase securities, you may pay for the securities in full, or if your account has been established as a margin account with the margin lending program, you may borrow part of the purchase price from Merrill Lynch. If you choose to borrow funds for your purchase, Merrill Lynch's collateral for the loan will be the securities purchased, other assets in your margin account, and your assets in any other accounts at Merrill Lynch. If the securities in your margin account decline in value, so does the value of the collateral supporting your loan, and, as a result, we can take action, such as to issue a margin call and/or sell securities in any of your accounts held with us, in order to maintain the required equity in your account. If your account has a Visa® card and/or checks, you may also create a margin debit if your withdrawals (by Visa card, checks, preauthorized debits, FTS or other transfers) exceed the sum of any available free credit balances plus available money account balances (such as bank deposit balances or money market funds). Please refer to your account documents for more information. You can lose more funds than you deposit in the margin account. A decline in the value of securities that are purchased on margin may require you to provide additional funds to us to avoid the forced sale of those securities or other securities in your account(s). We can force the sale of securities in your account(s). If the equity in your account falls below the maintenance margin requirements or Merrill Lynch's higher "house" requirements, we can sell the securities in any of your accounts held by us to cover the margin deficiency. You also will be responsible for any shortfall in the account after such as sale. We can sell your securities without contacting you. Some investors mistakenly believe that they must be contacted for a margin call to be valid, and that securities in their accounts cannot be liquidated to meet the call unless they are contacted first. This is not the case. We will attempt to notify you of margin calls, but we are not required to do so. Even if we have contacted you and provided a specific date by which you can meet a margin call, we can still take necessary steps to protect our financial interests, including immediately selling the securities without notice to you. You are not entitled to choose which securities in your account(s) are liquidated or sold to meet a margin call. Because the securities are collateral for the margin loan, we have the right to decide which security to sell in order to protect our interests. We can increase our "house" maintenance margin requirements at any time and are not required to provide you advance written notice. These changes in our policy may take effect immediately and may result in the issuance of a maintenance margin call. Your failure to satisfy the call may cause us to liquidate or sell securities in your account(s). You are not entitled to an extension of time on a margin call. While an extension of time to meet margin requirements may be available to you under certain conditions, you do not have a right to the extension. There are costs associated with owning a mutual fund or ETF, such as annual operating fees and expenses. This and other important information is included in the prospectus, which should be read carefully before investing. Contact us to obtain a fund's prospectus. For more information about investing in mutual funds at Merrill Lynch, please read the Mutual Fund Investing at Merrill Lynch pamphlet (PDF) or consult our glossary. For more complete information, clients should obtain the prospectus, and/or if available, the summary prospectus, from their Financial Advisor and should read it carefully. Before investing, carefully consider the investment objectives, risks, and charges and expenses of a fund. This and other information can be found in the fund's prospectus and/or, if available, summary prospectus. Prospectuses for mutual funds can be obtained through the investor's sign-in area of merrilledge.com. Clients of the Merrill Edge Advisory Center can also call 1.888.654.6837. 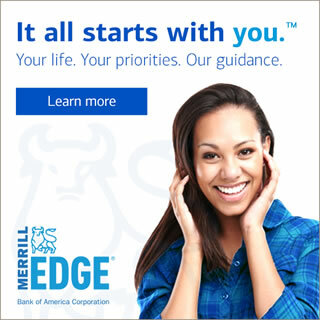 If you're not currently a Merrill Edge client, please call 888.637.3343." Exchange Traded Funds are subject to risks similar to those of stocks. Investment returns may fluctuate and are subject to market volatility, so that an investor's shares, when redeemed or sold, may be worth more or less than their original cost. You should carefully consider the investment objectives, risks, charges, and expenses before investing in this product. This and other important information is included in the prospectus, which should be read carefully before investing. Prospectuses can be obtained from your investment professional or through the investor's sign-in area of bankofamerica.com/investments. Footnote 8 Diversification does not ensure a profit or protect against loss in declining markets. Footnote 9 Please review the Merrill Guided Investing Program Brochure at merrilledge.com/guided-investing-program-brochure for important information including pricing, rebalancing and the details of the investment advisory program. Your recommended investment strategy will be based solely on the information you provide to us for this specific investment goal and is separate from any other advisory program offered with us. This program is not offered through an advisor. Merrill Edge investment advisory programs are offered by Merrill Lynch, Pierce, Fenner and Smith Incorporated ("MLPF&S"). MLPF&S and Managed Account Advisors LLC ("MAA") are registered investment advisors. Investment advisor registration does not imply a certain level of skill or training. Footnote 10 The Merrill Edge Select® Portfolios are part of the Merrill Edge Advisory Program and require participation in the program to invest. In addition the Merrill Edge Advisory Program is sponsored by Managed Account Advisors (MAA) an affiliate of MLPF&S. MLPF&S and Managed Account Advisors LLC (MAA) are registered investment advisers. Investment Adviser registration does not imply a certain level of skill of training. Please review disclosure statement for a full description of services and fees.